In what appears to be a crucial strategic move ahead of the impending Assembly elections and the 2019 general elections, Nationalist Congress Party (NCP) president Sharad Pawar, National Conference (NC) supremo Farooq Abdullah, and Telugu Desam Party (TDP) president and Andhra Pradesh Chief Minister N Chandrababu Naidu are meeting in the national capital. Later, Naidu also held a meeting with Congress President Rahul Gandhi. 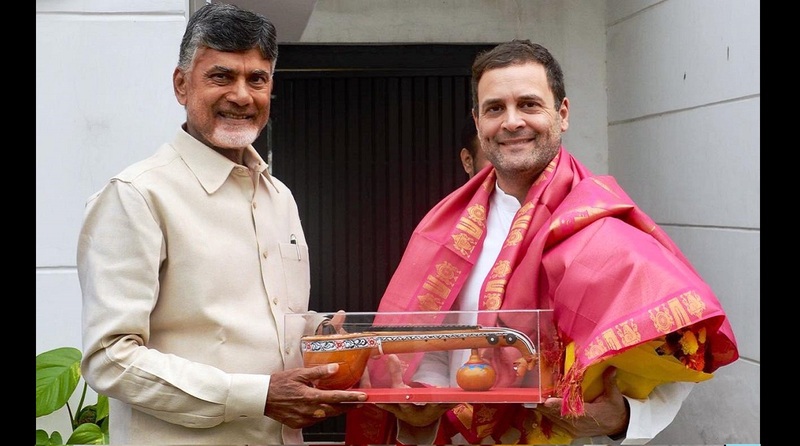 TDP and Congress are engaged in seat-sharing talks for the Assembly elections, and during the meeting, the leaders will also discuss the 2019 Lok Sabha, they said. Naidu had met BSP chief Mayawati, Farooq Abdullah, and former BJP leader Yashwant Sinha in the national capital on October 27. A TDP leader said that the party chief is playing the role of a “facilitator” to bring together all opposition parties to stop the BJP juggernaut in the 2019 general elections. Though he had ruled himself out of the prime ministerial race, the Andhra CM had earlier said that his party would play a key role in the 2019 polls and that regional parties would form government at the Centre. According to TDP sources, Samajwadi Party chief Akhilesh Yadav spoke to Naidu over the phone on Wednesday and the latter will visit Delhi every week to speed up the process of uniting opposition parties. Interestingly, this is Naidu’s second visit to New Delhi within a week and comes on the heels of talks between the Congress and the TDP over seat sharing in poll-bound Telangana which votes on December 7. A disgruntled Andhra Chief Minister had earlier this year walked out of the NDA over the demand for special status for Andhra Pradesh. Senior Congress leader M Veerappa Moily had a few days back said that the N Chandrababu Naidu-led Telugu Desam Party is welcome to join the UPA for the cause of a united fight against the BJP and NDA. Going by the buzz in political circles, Naidu is very actively working for the formation of a concrete coalition these days and in touch with virtually every opposition party in a bid to reach a pre-election arrangement for a direct fight against PM Modi led BJP.